Holy Moly & The Crackers. North East frenetic alt-rock folk septet Holy Moly & The Crackers are hitting the road and heading for Leeds next month. They have just popped the lid on a new live video for ‘Cold Comfort Lane’ ahead of a chock-load of UK shows and are promising a new album will be on the go next year. Never ones to miss an opportunity to let their (and your) hair down, the rabble rousing bunch will be hitting the road for a slew of their famously feverish live dates before 2018 is out. Eyeing up UK towns and cities the length and breadth of the land, the outfit will be embarking on an adventurous November tour that will bring them to the Brudenell Social Club on November 23. Ensuring their audiences are primed and fully on brief for the proceedings ahead, Holy Moly & The Crackers have released a rambunctious live version of their irresistible hit single ‘Cold Comfort Lane’ as a taster of what’s in store at their well-honed live shows this winter. 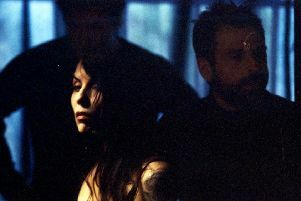 Already included on major Spotify playlists, including Fresh Find & New Noise, and with the studio version clocking up over one million streams, the contagious ’Cold Comfort Lane’ has also popped-up on E4, BT Vision, Capital One, Ultimate Ears, KIA Sportage Cars and can even be spotted on the credit title track for the blockbuster movie Oceans 8. Speaking about the track and upcoming shows, Crackers-man Conrad said: “It’s been a bit of a mad year for our song ‘Cold Comfort Lane’ - it just seems to have hit a certain nerve! So, we really wanted to get a live version down. Floating on something of a high-water mark, the last few years have been huge for the female-fronted Holy Moly & The Crackers, with demand seemingly never greater. In 2017, the ever-evolving folk-alt-rock collective released their album ‘Salem’ via their own Pink Lane Records label to widespread acclaim from the likes of R2 Magazine, Folk Radio UK, The Crack, Clash Magazine, No Depression, Blown Speaker, not to mention rave support at Radio from BBC Radio and Radio X, and of course overwhelming public support that continues to spread like wildfire across continent. Selling out venues across the country and drawing heaving crowds at festivals, Holy Moly also landed successfully in The Netherlands, France, Germany, Czech Republic and Italy where Crackers’ chatter is only getting louder. With a veritable army of fans on tenter-hooks in anticipation of their next move, HMATC have lifted the lid (a little) on progress of their forthcoming third album. “We’ve just finished our new album and we hope to release next year, so you might see a couple of songs creeping into the setlist at these upcoming gigs,” said Conrad.